The May 3rd hearing was the second hearing held in New York State. The first hearing was held in the Capital of New York, Albany on April 23, 2018. NY Against AS attended both hearings. NY Against AS was surprised to learn that there were a number of leaders who oppose Assisted Suicide in New York, who applied to provide testimony but they were denied. Instead, the leaders were told by the office of Assemblyman Gottfried, Chairman of the Health Committee to attend on May 3rd, even though those same leaders had work conflicts. The result was a hearing that in NY Against AS's opinion, was unbalanced. More testimonies in support of assisted suicide were given permission to present, than testimonies in opposition. More legislators heard the unbalanced-in-ratio of testimonies than the hearing in New York City. 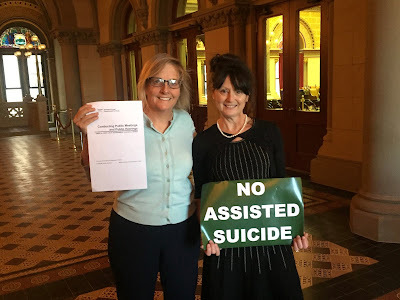 This caused an appearance to legislators and on-lookers in attendance in Albany, that there were more in support for assisted suicide than the actual truth. At any given point in time, there were about 8 legislators in attendance of the hearing. Images below are taken at NY's first hearing on April 23, 2018.
opposition to the as/euthanasia agenda and bill.